Kentucky makes some mighty fine bourbon. 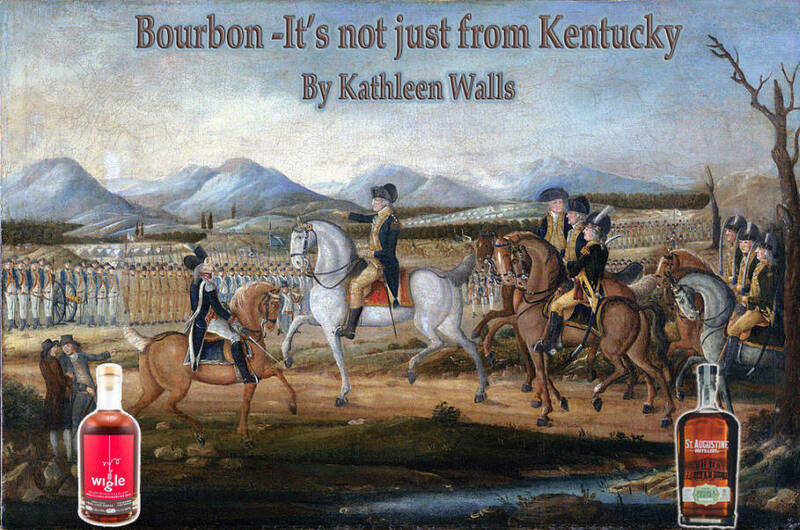 I've visited the Bardstown Kentucky Bourbon Trail. and loved what I saw and tasted. But distilleries in other states have discovered the appeal of bourbon. Arguably, bourbon has surpassed scotch as the drink of choice in the U.S.
"America's Native Spirit" has certain requirements to be considered bourbon. Mash must be a minimum of 51% corn, distilled to no higher than 160 proof, and barreled no higher than 62.5% in charred, new oak barrels, and it cannot contain additives. These two distilleries I visited recently have begun producing some mighty fine bourbon along with other spirits. Both offer an interesting insight into their area's history as well. 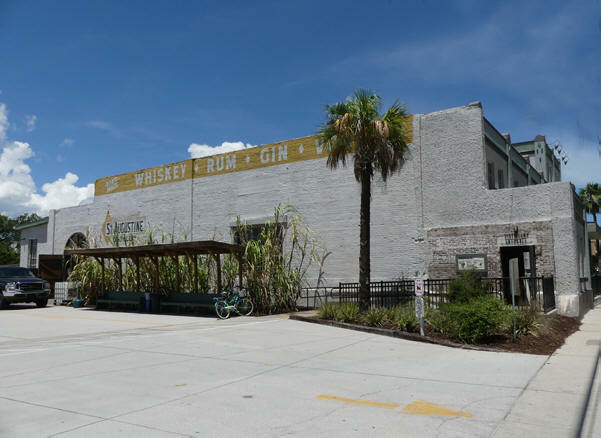 One of St. Augustine's newest attractions, the St. Augustine Distillery, connects with its historic past. 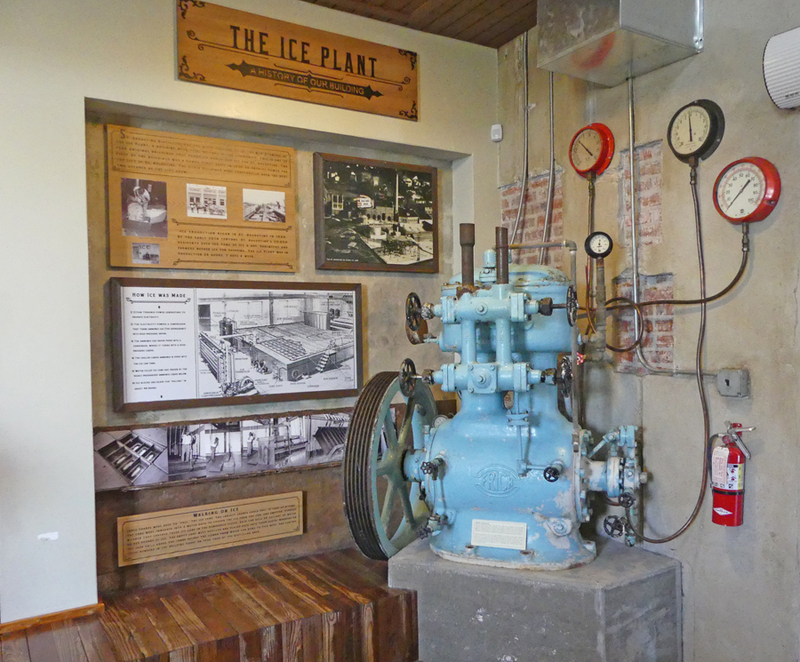 The ice/power plant that houses the distillery has been a part of St. Augustine history since 1905. Even in its early use, the site was about recycling. The power plant used the condensed steam from the boilers that created the power to recycle back into the boilers or to make ice. In that time period, there was a huge demand for ice. Residents needed it to keep food cool in their ice boxes, fishermen and shrimpers needed it ship their seafood; and railroad box cars needed ice to refrigerate Florida produce sent north. 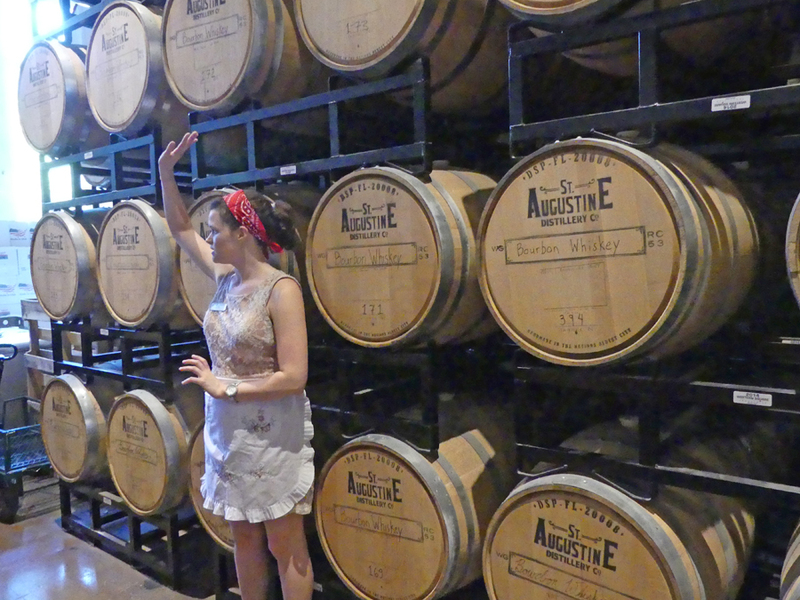 St Augustine Distillery has continued this repurposing cycle in a big way. The original Ice Plant exterior and much of the interior has been preserved but the recycling goes beyond that. Way beyond. Just some of the authentic touches in the distillery are steel factory doors from the 1930s for the exterior entrances and steel windows similar to the ice plant's original ones. Inside you will see a 1880s bar top, 1870s work tables, benches from the original Hershey's Chocolate factory in the distillery tasting room, 1900s 5-foot cast-iron trough sink in the ladies' lavatory. Reclaimed wood from historic 1860s Georgia homes were turned into floorboards and the bar's grand entrance staircase. The movie screen and bench ends in the video room are from a 1920s Jacksonville theater. Salvaged beams and reclaimed bricks create a unique space between the bar and gift shop. Working machinery that could be salvaged were. The distillery sugar cane mill used for the rum is from 1883. 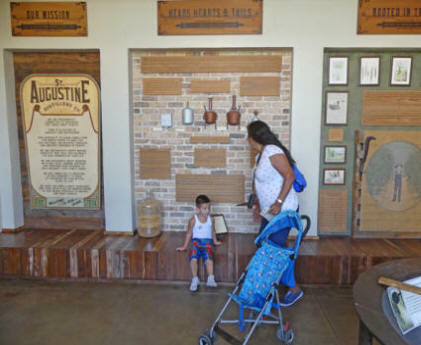 Your tour starts in the theater just past the small museum near the front entrance to St. Augustine Distillery. Here you learn the recycling doesn't end with the structure. Neither does the "green" spirit. Local farmers produce the corn, cane and other grains as well as the citrus that are used to create the distillery's unique spirits. Yes. 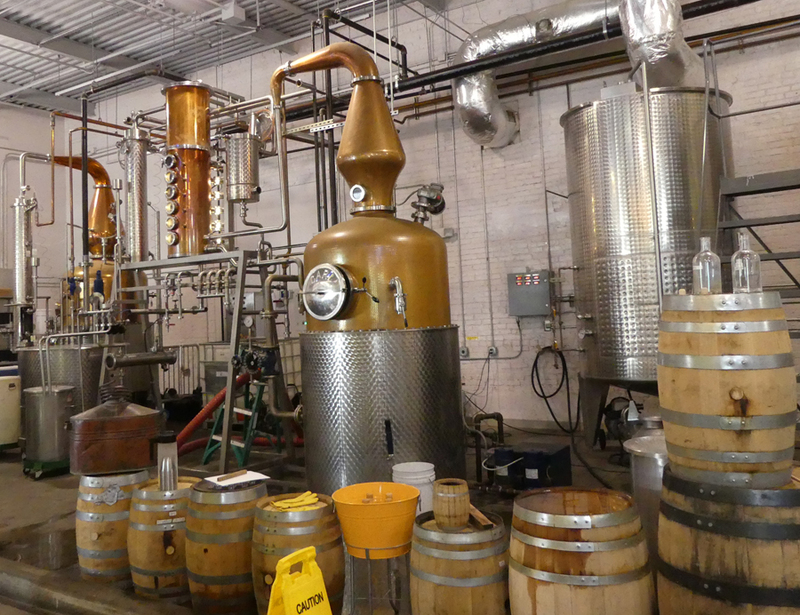 They produce other spirits besides bourbon; gin, vodka and rum. The used mash is then recycled back to the farmers for cattle feed. No waste here. You step into the distilling area and see the only remaining wall from the 1905 power and ice plant. This dates back to 1917 when the original power plant building was enlarged to start their ice production. Our guide, Emily, points out an old bridge crane that was used to lift 300 pounds of ice out of their ice cube trays as she says, "Making ice is easy. Booze is a lot more work than making ice and taste better in your glass than ice." She points out the different machines and explains the process. She talks of the three byproducts heat, co2 and alcohol..Their stills are named. Becky is the cooking still. It's named for one of the owners' grandmother who liked to cook. Next is Ella, the refining still. Emily explained "This one is named after Ella Fitzgerald who had a very beautiful refined singing voice." 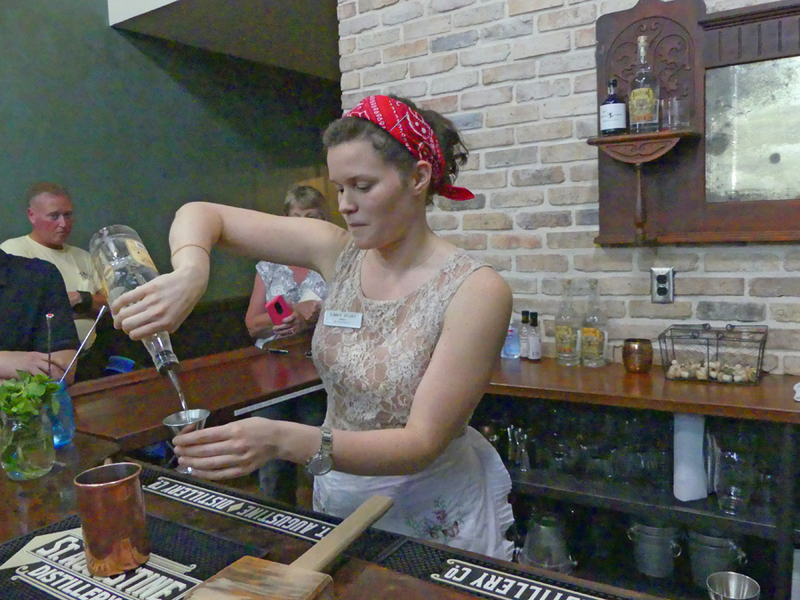 Stills at St. Augustine Distillery, Becky and Ella. Some of the original building material showing here. She explained the process that distills from the beer to the higher alcohol content, leaving three parts heads, hearts and tails. Naturally they keep the hearts and put it into smaller still to finish. With the bourbon it is then put in barrels to age. We then move on the section where the barrels are aged. 60 % of the flavor of bourbon comes from the charring and the barrels expanding and contracting. She pointed out how hot it was in that room. It is an important factor in the bourbon making process. Emily explains why the barrel tiem in Florida is less than other places. From the start, making Florida's first bourbon was the aim of the distillery owners, Philip McDaniel and Mike Diaz, but because of the strict aging rules related to American's Native Spirit, it was economically feasible to produce these other spirits. While waiting out the required ageing period. 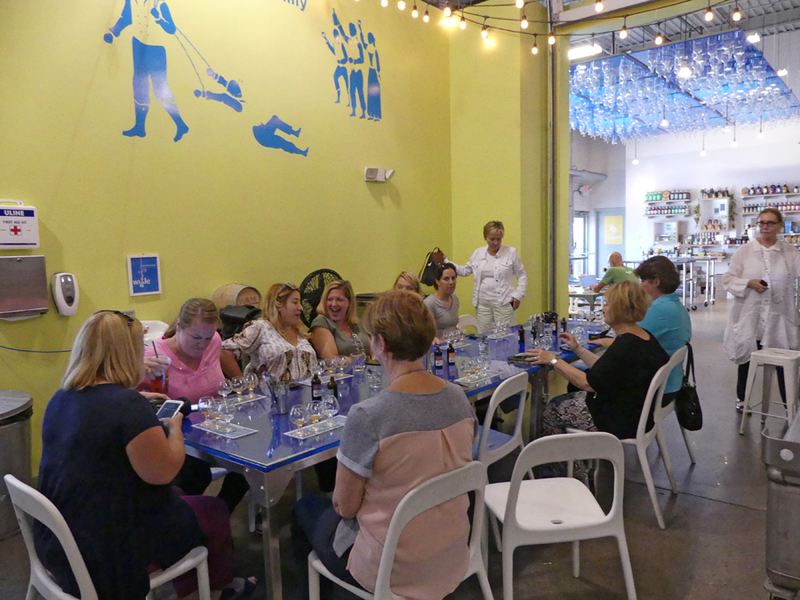 When we moved to the tasting bar and I tasted the tour samples of the rum, vodka and gin, I had to agree; they live up to the distillery's gold standard. 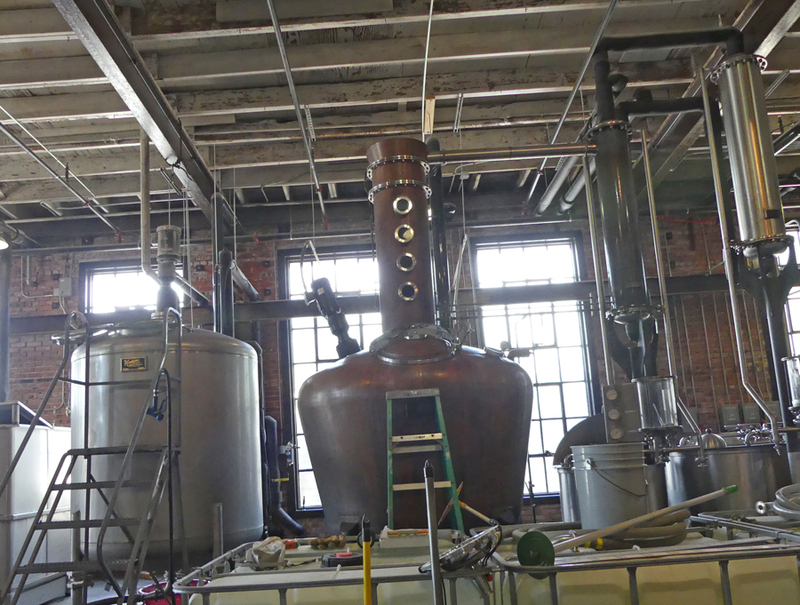 The distillery opened in March of 2014. It was September 9, 2016 when their first small batch bourbon saw the light of day. It must have seemed like forever for the owners but in the bourbon time scale it was lightning fast. Co-owner Mike Diaz explains the reason, "Bourbon is typically made in very inexpensive barrels because it's a single-use barrel. We chose a different path. We chose to invest more money in our barrels using thicker staves because we felt that we could get a richer flavor and get more utilization out of those barrels later, with our rum program." He added another reason their dreams were able to come to life so soon, "A couple key discoveries for us were that bourbon color and flavor extracts much more quickly in the Florida heat, particularly the summers. We joke that our bourbon ages in ‘dog years' in Florida due to the high heat and humidity." The Ice Plant Bar and Restaurant on site serves all of their products as well as Farm to Table foods mainly from local farms. It's intimate and cozy. Just the place to relax after a busy day of playing tourist around St. Augustine. If you want to take a tour, the distillery is open Monday through Saturday from 10 a.m. to 6 p.m. and Sunday from 11 a.m. to 6 p.m. with free tours and tastings beginning every half-hour until 5 p.m. Even better take the A1A Cocktail Trail they, along with the Florida Department of Citrus and the St. Augustine, Ponte Vedra & The Beaches Visitors and Convention Bureau are promoting. 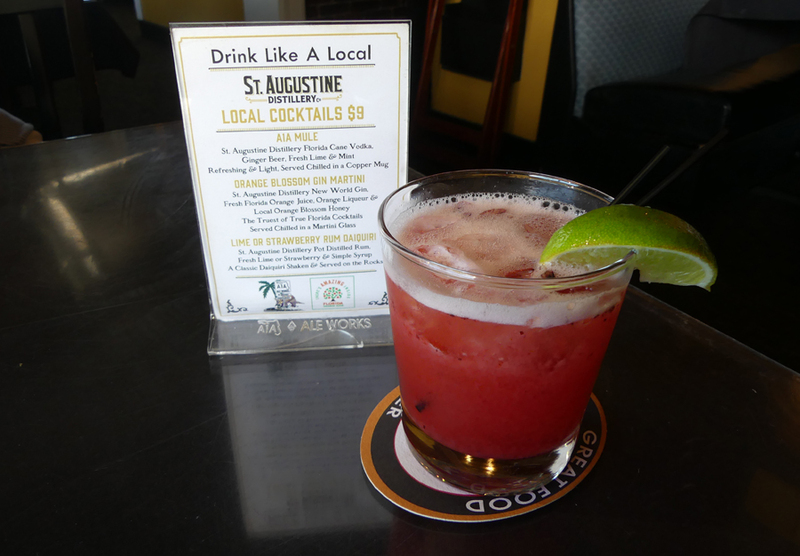 Beach bars and restaurants from Atlantic Beach to historic St. Augustine are participating. 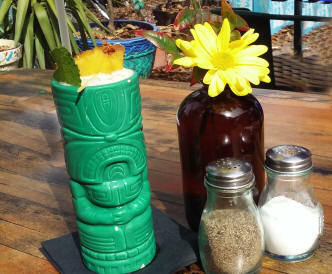 All you do is pick up a passport at any one of the participating sites and have it stamped when you visit and enjoy a cocktail made from original Florida products. When completed take it to the St. Augustine Distillery for a collectible A1A Cocktail Trail t-shirt and branded, wooden coaster set. Each of the places taking part is unique. North Beach Fish Camp in Neptune Beach specializes in local caught seafood. 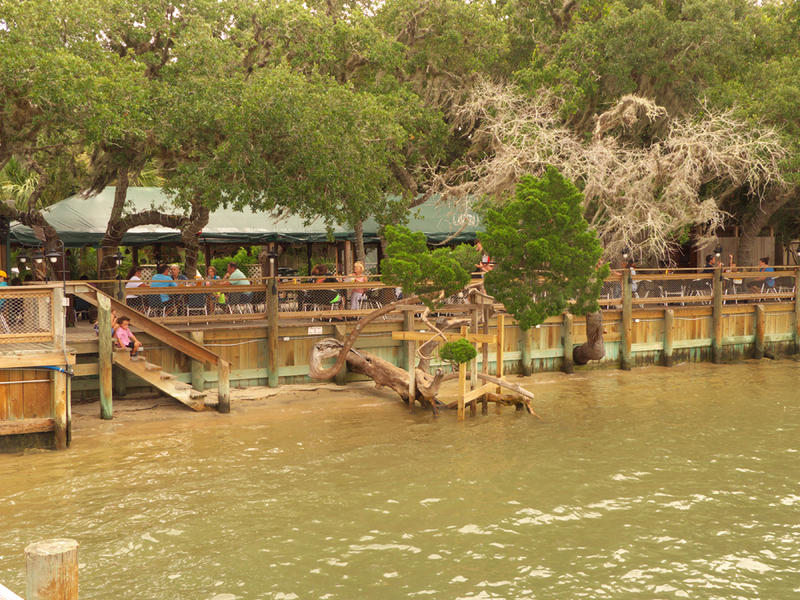 Ragtime Tavern Seafood & Grill was voted one of Florida's "Top 200" restaurants by Florida Trend Magazine. In addition to the cocktails and seafood, they have an on-site brewery. Hoptinger has an old fashioned German Beer Garden flavor. Their slogan, "We are the Wurst" gives you a clue what to order here. Cap's on the Water lives up to its name. It is right on the water of the Intercoastal. There is even a beach area for sunny days. Dining can be on the waterfront patio or inside. It's a fun Florida atmosphere. 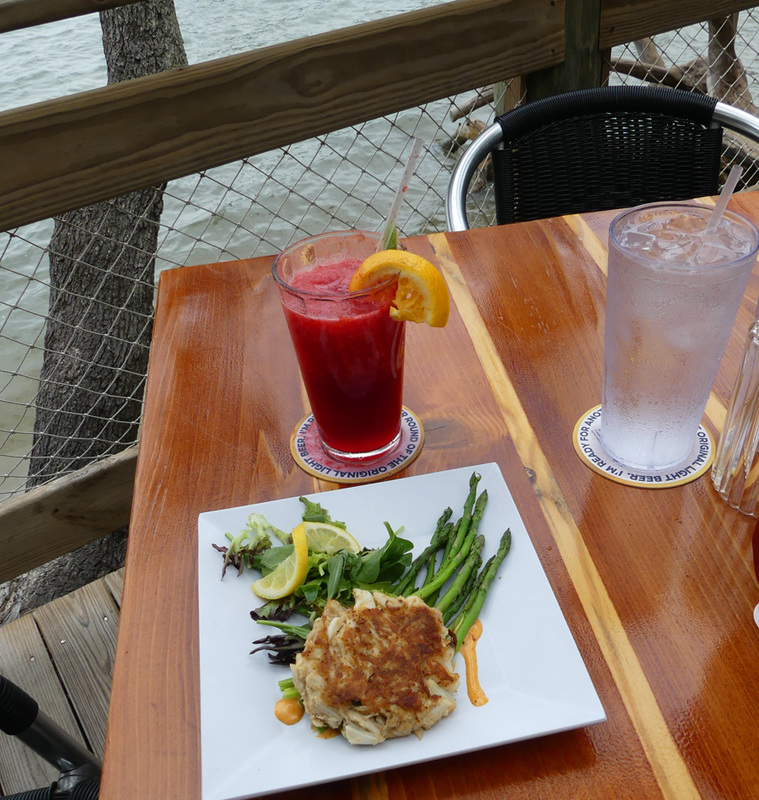 I had their Parmesan Crab Cake served with asparagus, green tomato jam and smoked pepper aioli and a Strawberry Daiquiri. My companion had the Shrimp Po' Boy. We both were happy. Hard to say which was best, the meal or the drink. The Reef is on the ocean. Dining upstairs near the window gives you a perfect view of rolling waves and blue skies with sea gulls playing tag with he ebb and flow of the waves. Odd Birds is one of the newer additions to St. Augustine's Historic Districe. Located just across the street for the fort, it is a great stop for a refreshing cocktail and bar food. They push the limits of inventiveness when it comes to concocting unusual drinks. 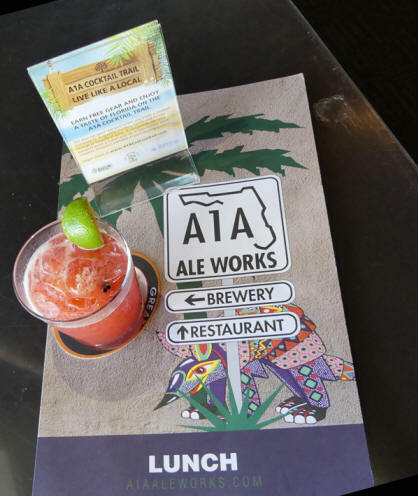 A1A Ale Works is your choice for dining while touring the bayfront. They are a brewery as well as a full service restaurant. The menu there is extensive and varies. 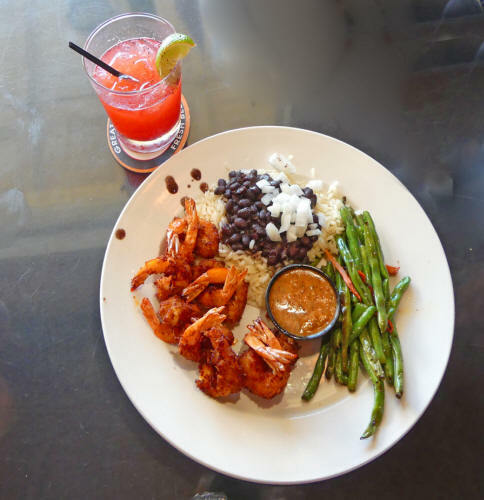 Many of the choices have a Creole touch while others have a Spanish touch. I enjoyed the Ragtime Shrimp covered with their own ale-infused batter, tossed in coconut and deep fried. It is served with honey mustard, black beans & rice and vegetables. My friend enjoyed the Lobster and Shrimp Tacos in crisp blue corn tortillas, wrapped with soft flour tortillas with pepper jack cheese, pico de gallo, lettuce and a citrus sauce also served with black beans & rice. Their beverage choices range from their own site-brewed ales to some very fancy cocktails. Naturally there are non-alcoholic choices as well. The Floridian is a classic Old St. Augustine style restaurant deep in the heart of the Historic District. It offers inside or courtyard dining just a block off St. George St. You never know who you might see here. 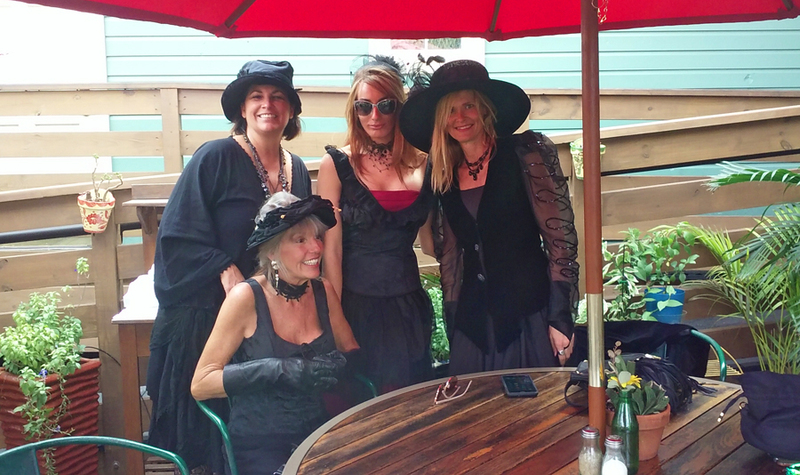 We visited just before Halloween and met a group of friendly witches. One interesting feature of this one is that many of its menu choices can be made with meat, seafood or vegetarian items. 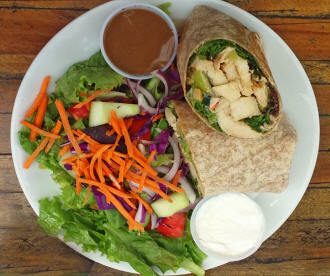 I enjoyed the delicious Fresco Burrito with chicken but it can be ordered with local fresh catch, shredded grilled chicken, or tofu. It's served in a whole-wheat tortilla with quinoa, greens, seasonal salsa and datil-chipotle mayo, with a side of sour cream. My daughter tried their Shrimp Po' Boy. 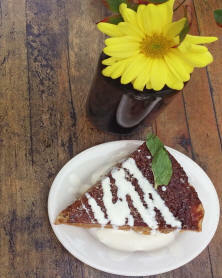 One of their unique desserts is their Honey Lavender Pie. The sea-salt caramel crust adds just the perfect touch to the sweetness. 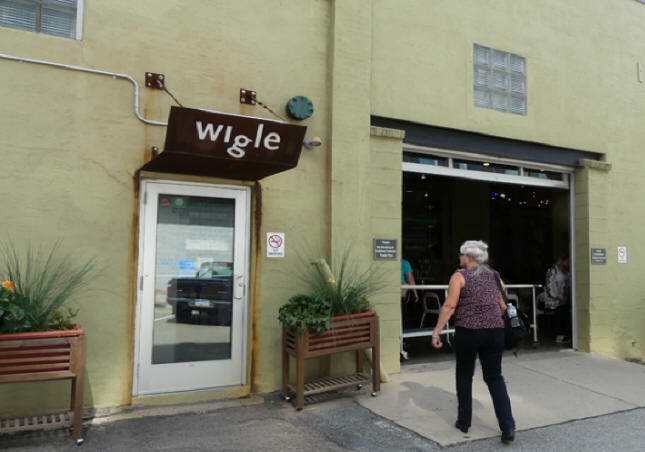 A visit to Wigle Whiskey is a lesson in post-revolutionary American history. Out guide, Jordan Pallitto, took us back in time to 1790. As he tells it, "Pittsburgh in 1790 is the edge of civilization. It is the place people come when they got kicked out of wherever they were before. This is westward; the edge of our new country. So things in Pittsburgh are pretty rough and tumble. And what happens when things are rough and tumble? What do we do when we are down and out? Jordan answers his rhetorical question in chorus with our group of agreeing journalists, "We drink. In the 1790s to mid 1800s Pittsburgh is drinking. They are drinking whisky. A whisky called Monongahela Rye Whiskey and not only are they drinking it; they are making it." For those of us unenlightened about Monongahela rye whiskey, myself included, he explained what it was and is. In the early days this Monongahela rye whiskey didn't look like it does today. It was clear. It wasn't aged in charred oak barrels but many people believe Monongahela rye whiskey was an ancestor of bourbon. 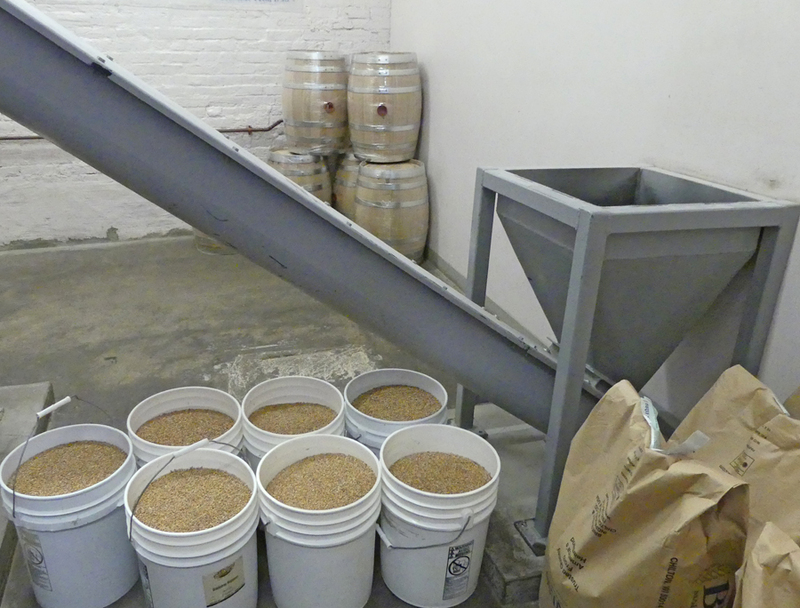 At Wigle Whiskey it starts wth the unprocessed grain. 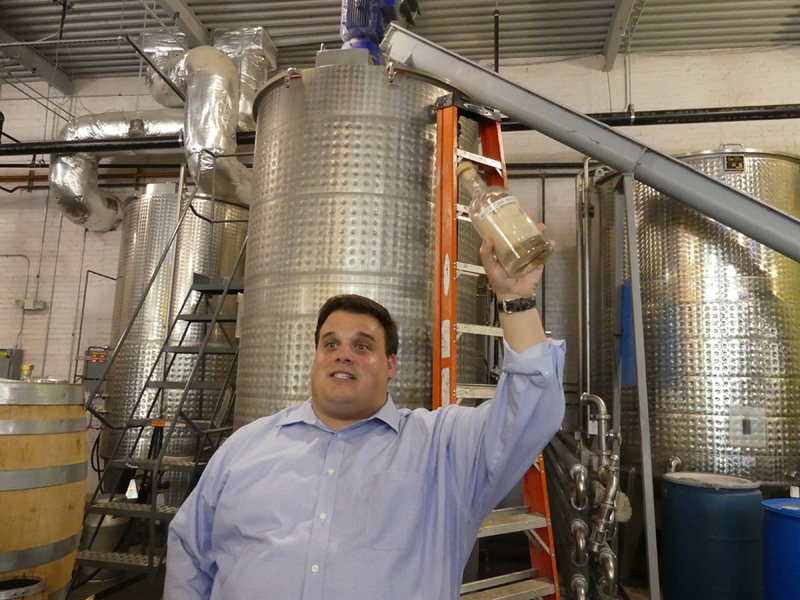 The Myer family in 2012 decided to open the first whiskey distillery In Pittsburgh since prohibition. They began Wigle Whisky. Here too, I found sustainability when Jordan told us, "We try to get all of our grains as close to locally as possible. When we first started, we couldn't find some of the grains we needed locally. Now, some of the local farmers grow a specific crop for us." 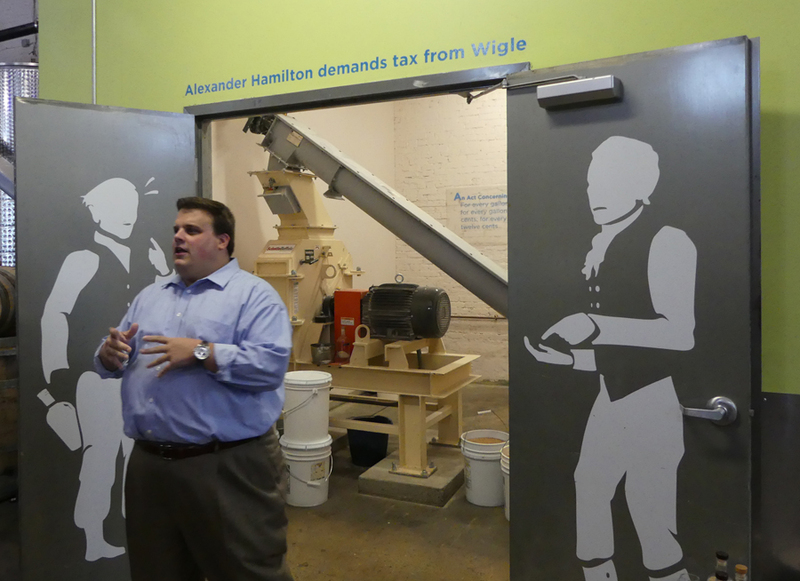 Jordan led us into the milling room of the distillery and showed us some of the heirloom grains that are made into Wigle Whisky. This is where those heirloom grains are put into hoppers. 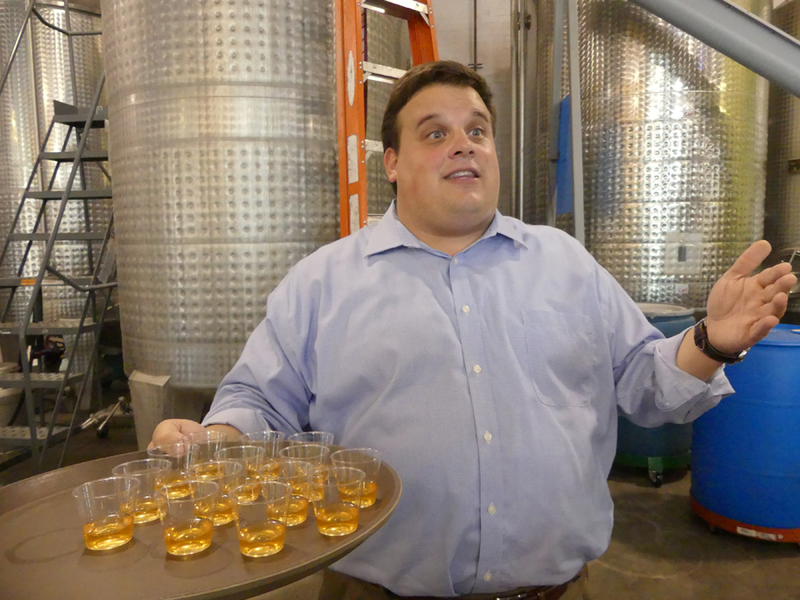 It then feeds into what Jordan referred to the "bully of the distillery. It's where the action happens. The hammer mill pounds those grains into grist. In Philip Wigle's day they didn't have a hammer mill with an electric motor but they had something hand powered or animal powered; something that pounded the grain into grist. At a lot of distilleries you won't see this. They buy their grain already pounded but at Wigle Whisky we think this is part of our more exciting production process to get the grain and do everything on site." Jordan passed the grist around. We tasted and found it to be a coarse rye flour. Buckets of fresh grain wating to be "hammered"
Jordan then began to tell us more of Philip Wigle's story. The bully of that story was Alexander Hamilton, the country's first secretary of the treasury. In 1791, we had just come out of a war. As everyone knows wars are expensive. Hamilton looked around to see a way to pay for this war. He decided a handy source of revenue was to tax the whisky makers. Since Philadelphia was one of the biggest whiskey producing states, they resented the burden of these taxes. They decided not to pay. Thus began the Whisky Rebellion. Being a great story teller, Jordan then stopped that story and moved us on to the next stage of the distilling and promised the rest of the Whisky Rebellion story after the next part of the present Wigle Whiskey making story. He led us to the big stainless steel mash tub. The grist goes into the tanks with hot water. The resulting mash begins to break down. Jordan resumes the Philip Wigle story. He tells us of Ben Wells, the tax collector and how the local distillers treated him. "There were 4000 stills in the western Pennsylvania region and they did not want to pay this tax. They ambush him and tar and feather him." We resume the tour and he offers us a sample of a honey spirit called Landlocked. You do want to try this one. This is just another example of similarities in different sprits. It's a Western Pennsylvania interpretation of rum made from scratch and pot-distilled from Pennsylvania buckwheat honey. We move to the important process of fermentation in the large fermentation tanks where they add yeast. This yeast eats the sugar and the byproduct is alcohol. We now have alcohol. And Jordan takes back up the background story. General John Neville takes up the fight for George Washington He leaves his beautiful mansion, Bower Hill considered the most beautiful home in western Pennsylvania, meets with Ben Wells and they go to collect the taxes. They go first to the home of Old Man Miller to collect the tax. He runs them off and reaches for his gun and points it towards General Neville. A few shots are fired towards a retreating Neville, Wells and company. 600 angry Pittsburghers with their whisky and guns then march to Bower Hill to have a conversation. Naturally a gun goes off and two men were killed and Bower Hill was burned down. We return to the whisky making process. Jordan tells us we now have beer with 6 to 10 percent alcohol and "now the magic happens where we go to 80 or 100 percent in these copper pot stills. Maybe somewhat like the ones Philip Wigle used, but the science is exactly the same. Alcohol will vaporize and after a few times we have moonshine. There is an art to taking something from moonshine stage to a palatable state. That is the art." He let us smell the heads part of the process. It is awful. He explained they use it as a cleaning fluid. After the hearts, he showed us some of the tails. Even more awful. Heads and tails both smell awful. Whigle Whisky makes bourbon as well as rye whisky and other spirits. Their Organic Pennsylvania Bourbon was released on Friday, May 29, 2015. This was the first bourbon made in Pennsylvania in over 40 years. It's made from Wapsie Valley corn, winter wheat, and malted barley, and distilled in one of these beautiful copper stills. It has a gentle sweet and earthy taste. They now make two other bourbons, Organic Cask Strength Pennsylvania Bourbon and Smoked Bourbon. Tasting is one of the most fun things about a tour. As we sit and enjoy a tasting, Jordan concludes his tale of the Whisky Rebellion. "Washington cannot tolerate what has happened to his head general. In 1794, the one and only time a sitting president led his troops into battle against his own people, George Washington advanced on Western Pennsylvania with 13,000 troops." Washington departed due to a bad back. The troops took about a dozen "rebels" into custody including Philip Wigle. The dozen men are taken to Philadelphia and Philip Wigle and one other were sentenced to hang. Fortunately, George Washington pardoned Philip Wigle. 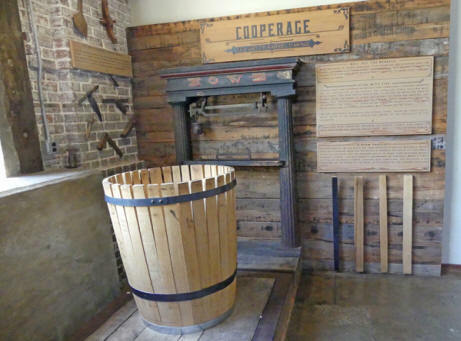 George Washington opened the largest distillery in America after his terms as president ended. Many of the Pennsylvania whiskey distillers moved to Kentucky and continue making whisky. Since the biggest crop there was corn. Thus was born bourbon. The tax was repealed in 1802. Don't miss a chance to visit both of these great distilleries.